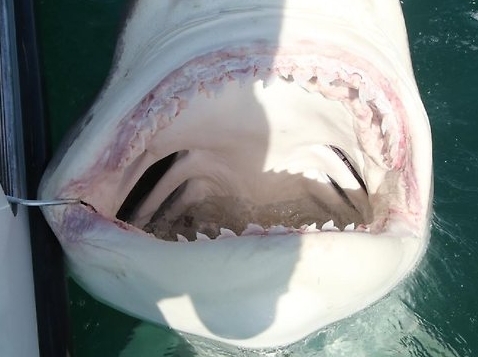 A MONSTER tiger shark that has been spooking surfers on the Sunshine Coast has been caught a few hundred metres from shore. The 4.72m giant was reeled in from a drumline off Yaroomba near Coolum Beach. 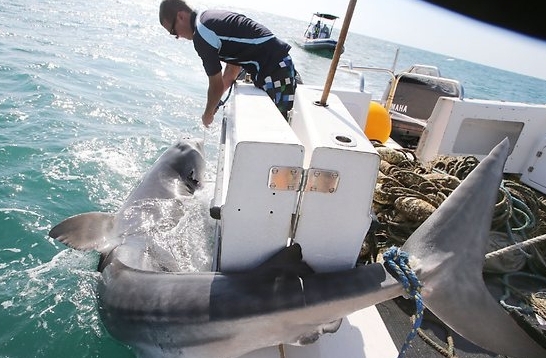 Shark catcher Paddy Dimond, doing his rounds yesterday morning as part of the State Government’s Shark Control Program, said it was the largest shark he had caught in the region in his five years in the job. Mr Dimond and deckhand Lachlan Tuckwell could not drag the 500kg-plus creature aboard. The tiger was destroyed, measured and dragged 5km offshore. As guidelines dictate, it had its stomach contents examined, revealing several baby sharks. Fisheries Queensland’s Shark Control Program manager Jeff Krause said it reaffirmed the need for drumlines and netting. This is a disgrace. How can we accuse the Japanese for whaling when Australian governments are killing sharks? It is no different. Given the technology and intel we have available, it is barbaric that the only policy solution that governments can come up with is to kill the sharks, destorying our already damaged marine ecosystem in the process. People call sharks monsters and yet we kill them because we are afraid they might hurt someone? The sharks own the sea. They were here before us. Why do people think they have the right to kill them for no good reason at all!? I love all animals but this shark has scared enough surfers in our area I am glad it’s been destroyed and anyone who says otherwise does not swim here and should look into the facts before they speak. The QLD Shark Control Program only remove sharks that are a threat. Really Sue? “this shark has SCARED enough surfers” ? How does that justify the need to kill it. If you have a dog, leashed or not, and it scares a few children , does that mean animal control should kill your dog ? Sharks arent a threat, they were put in the ocean for a reason, they keep the ecosystem in check, feeding on the old and weak so that only healthy populations survive, if a surfer gets eaten that is his/her own fault as surfers know the dangers of surfing yet they still go out into the surf and have the audacity to get a shark killed because it scared them? kill all sharks that are able to attack humans and reclaim the oceans for our pleasure! oh, and forget about that ecosystem blabla. BTW…We even Have shark survivors,who are against the killing of sharks,I personally had a friend taken,but as sad as that is,does NOT mean they should be killed for living in their own environment,my friend always told his wife n children,if ever anything happens to me in the ocean,please do NOT let them hunt the animal down,I’m the intruder & I RESPECT that,we make a conscious decision to enter their home,we should be aware & responsible for any encounters! We have ‘Kelly’ famous surfer who is anti-cull & broke off all sponsorship with quicksilver,as they were pro-cull,we have a navy diver,who lost his arm & leg,he is anti-cull,surely if these survivors can see why we need sharks etc,then why can’t Government & others see it?